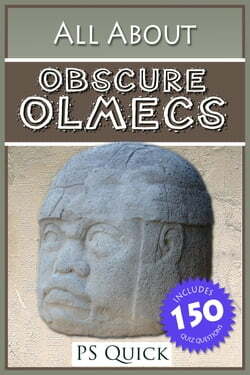 This book, filled with amazing facts and photographs, gives an in-depth account of what life was like for the ancient Olmec who lived in Mesoamerica. It explains how religion influenced their beliefs and everyday lives and draws upon archaeology and research to present evidence that supports present... read more ideas. In addition to information on mythology, religion and gods it covers the topics of society, government, trade, industry, homes, farming, science, mathematics, writing, sculpture and artwork.The ‘All About’ series is an educational collection of books by P S Quick, and is targeted to interest children of 9 to 12+ but will fascinate readers of all ages. At the end of each book there is a quiz section for the reader, featuring 150 questions and answers.